“If you’re sending Broadcasts to ‘All Subscribers’, then you’re definitely not using ConvertKit to its full potential“. I tell my 1:1 ConvertKit clients this allll the time. ConvertKit is an incredibly powerful system. If you’re not using the wealth of information you’ve already got about your subscribers (which form they signed up to, what links they clicked, which tags they have, etc), then you’re unnecessarily or confusingly sending them emails they probably don’t want. 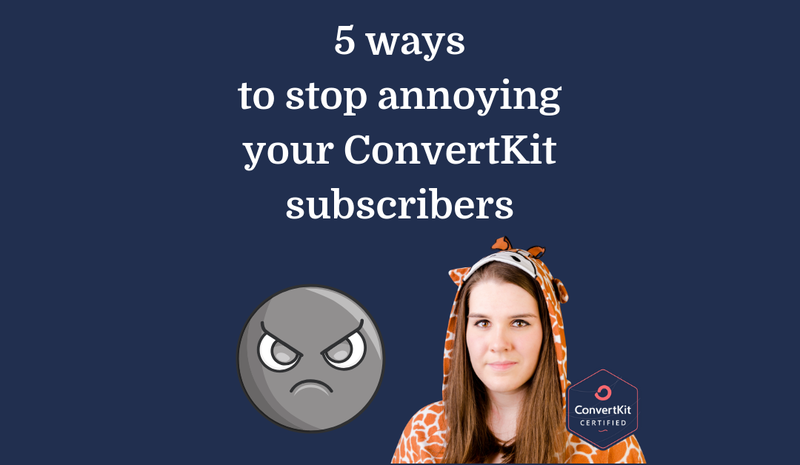 In this blog post I’m going to teach you 5 easy ways to stop annoying your subscribers. Let’s say you’ve set up a beautiful new welcome/nurture sequence that’s 5 emails across 10 days. All new subscribers go through this sequence. You send a weekly newsletter on Thursdays. Bob signs up for your epic freebie opt-in. Bob starts to receive your welcome sequence. You don’t want Bob to get your weekly newsletter until after he’s completed the welcome sequence. It’s disjointed for him to get a carefully planned intro email on one day, and then a generic update on your business the next day, and then back to the carefully planned intro emails the day after that! Want to avoid doing this? Read this blog post here and then this blog post here. I’m sure you’ve had this happen to you before. You’ve signed up (and paid!) for something, only to continue receiving endless emails about how you should totally sign up/join. It’s annoying. (This is an example for emailing your regular list about Course X). 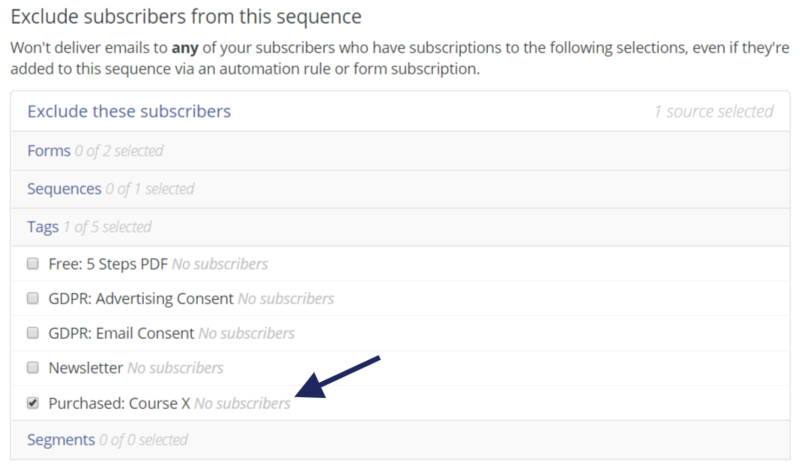 You’ve got 2 options for excluding certain subscribers from receiving sequence emails. You know how it goes. 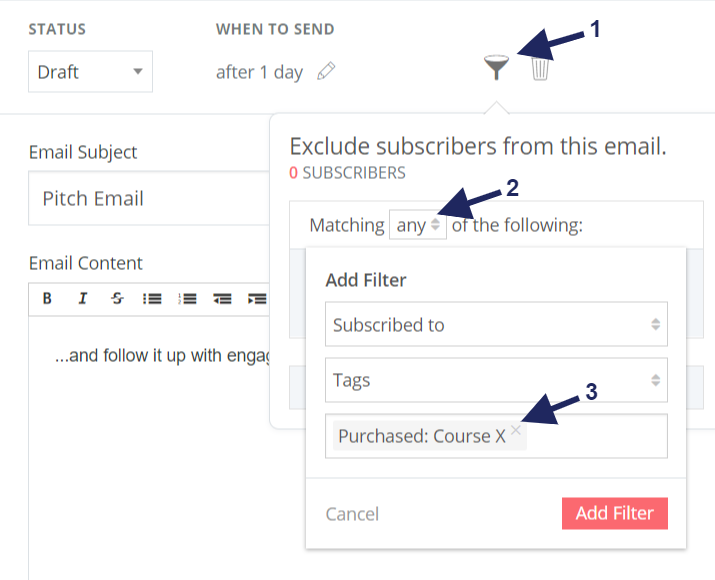 This neat little trick is going to save you a ton of unsubscribers when you’re launching. To unsubscribe from all my emails including any paid courses you might have: click here. You can find out more about setting up custom unsubscribe links here, alternatively check out my Template Toolkit training which includes a full video walkthough of setting up your own branded email templates and custom unsubscribe links. So you send launch emails to your specially created Segment, and you use your specially created custom email template. After the launch is over, you can just delete the tag, delete the segment, delete the automation rule and probably delete the custom email template! We already talked about this in #3 above, but seriously, custom unsubscribe links are awesome. They allow people to tell you what sort of content they do and don’t want to receive from you (which reduces unsubscribe rates). If you email about 2 quite different topics, give them the option to unsubscribe from emails exclusively about one of the topics. (I do this – I give people the option to unsubscribe from emails that are solely about ConvertKit). 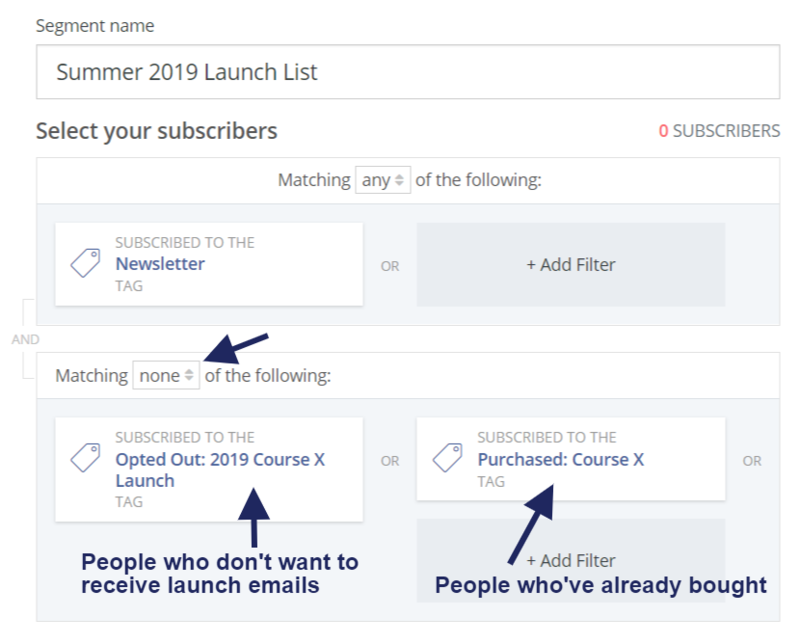 If you’re running multiple businesses/projects from the same ConvertKit account, you’re definitely going to want to be using custom unsubscribe links. A word of warning though – make sure your automation rules relating to custom unsubscribes make sense and people who click them don’t just fall into the abyss. For example, if someone unsubscribes from your free challenge – make sure you actually add them to your regular list. This is another reason I recommend adding a tag to say they’ve unsubscribed from that specific thing – it makes it easier to track them down in future! Update March 2018: Okay, so there used to be a video here, but that no longer works (it was based on ‘In Sequence’ tags, which I no longer recommend). Where possible, I now strongly recommend having one generic welcome sequence that all different opt-ins and such filter into. An alternative to this is changing the sending time of different sequences (so at the very least they don’t all send at the same time each day). Similarly, you may also want to consider which day of the week sequences send and stagger those. I’ve been using ConvertKit for 6 months now and never knew about this feature – THANK YOU so so much! This video and your other blog posts are going to be life savers! Wow! Super cool Convertkit tutorial. I actually don’t use Convertkit yet…but those features are really appealing. I can’t seem to find this answer anywhere else…maybe you know the answer! How do you add an email to a sequence and NOT have it send out to the subs that have already gone through that sequence? HI Elizabeth, thanks for the great articles on CK. I LOVE CK and have recently started using the custom unsubscribes. However I’ve run into something that I’m wondering if you have any insight into. It seems in CK when someone unsubscribes they cannot ever re-subscribe unless its with a different email address. Their original email address is deactivated and they cannot reactivate it. What I’m finding is that someone decides they want to unsubscribe to everything for a season of time, then they tap into a new product I have, they do not get the product emails because their CK was forever deactivated (unless I contact CK to reactivate them–but too often they don’t know that they’re not receiving emails–you aren’t missing something you’re not looking for). I’m finding this is unique to CK. Have you discovered this? Any insight? Okay so this is a great question. If someone unsubscribes they can become resubscribed if they sign up through a ConvertKit form. However, if they sign up somewhere anew that’s integrated with ConvertKit through the API (e.g. Leadpages, SamCart, most integrations really), then they don’t get resubscribed. They can also never be reactivated on any sequences. So if they’re buying something new, then that would be integrated through the API and they wouldn’t get emails again, no. Please do let me know if that helps or not! Hello! Question, I am just starting with my blog, still in construction phase and made my form and sequence with welcome email to subscribe and made a trigger for unsubscribe as required but I have it directed to a page on my website that says you are now unsubscribed but I want it to go to an unsubscribe form for them to click into and choose instead of going to a page if that makes sense. How to I fix this? Shoupdnr unsubscribe go to a convertkit box instead of my site? Thank you I am signing up for your tutorials! Kelli P.